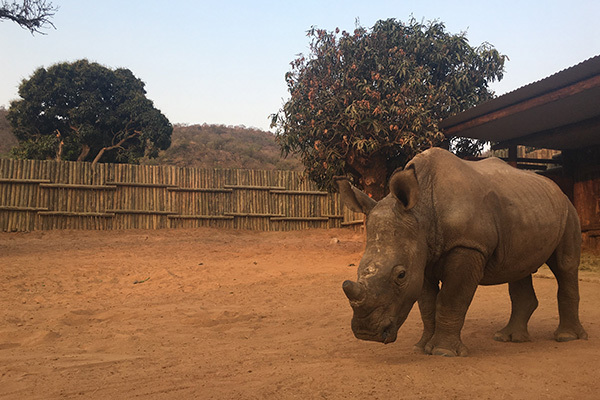 Baby Rhino Busiso at Baby Rhino Rescue | Adopt and Donate Now! On Friday the 24th of February 2017, a rhino calf bull named Busiso, which means ‘Blessings’ in Swazi arrived at Care for Wild. He was found a few days after his mother and sister were poached. 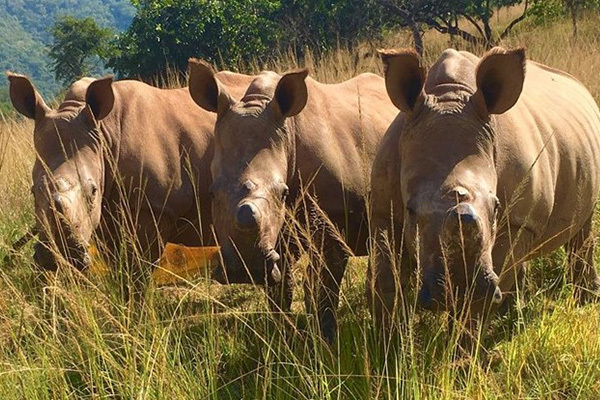 After being chased by lions and saved by local rangers, Busiso sought refuge with a crash of older rhinos. Sadly, he was unwelcome and a male wounded him under the neck. Terrified, Busiso ran away into the bush and he was lost for a while. Fortunately, as soon as he was rediscovered, Busiso was taken into the CFW sanctuary. With severe injuries, Busiso required the constant care of Care for Wild staff. When his blindfold was removed, his beautiful eyes amazed everyone. Busiso quickly came to trust his care givers allowing them to give him milk and medicine. He was moved from the crate into a night pen. He had abnormal discharge from his nose, when that finally cleared he began to feel good. To prove this, he broke through a fence to play with Lofo and Twinkle! Now the happy trio spend all their days and nights together, grazing and napping together. Busiso has a secret crush on Jemu, a beautiful rhino female, from the neighboring crash. He has access to Jemu during the day when the crashes share the outside field and often is found simply standing by her side or lying next to her in the wallow! One night Busiso even went to Jemu’s night pen, instead of heading back to his own! Busiso is approximately a year and a half old and he has a huge appetite. He weighs over 400 kgs and is a happy, healthy, rhino boy.